Just Julie B's Stampin' Space: ...And then there were Cupcakes! ...And then there were Cupcakes! With all the cupcake cozies and picks made up, I had to make cupcakes!! I got this cardboard Halloween cupcake stand at the cooking store nearby. 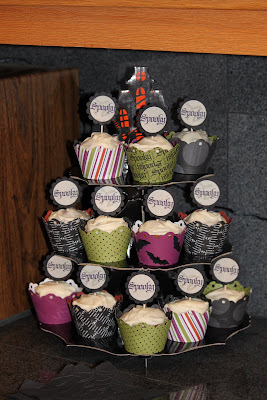 I wasn't quite sure I wanted to get a "real" cupcake stand yet, so this was cool for now! Here's a close up of one of the cupcakes, and I'm really glad I got the Perfect Setting die now! 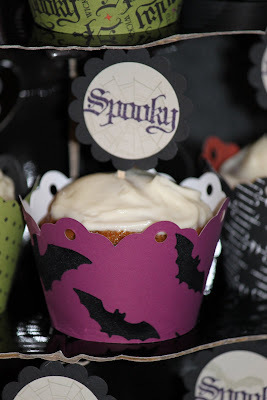 I just love how these dress up the cupcakes - and especially with our coordinating papers, sets, colors - Too Cool! Super cute. I'm now following you from SC. Mini Lunch Sacks are So Cute! What a Difference Glitter Makes! November Technique Class Coming Up! It's going to be a Cute Christmas! Just one more quick Halloween Idea! How Many Days till Christmas?! Scallop Square Duo Treat Pocket! No Tricks, Just Treats Class!